The artist depicted his painting “Two Sisters” in several images. Copies of the image titled “In the Sketes”, made by the artist in 1915-1916 and 1922, are currently in museums in Ukraine and the Czech Republic. 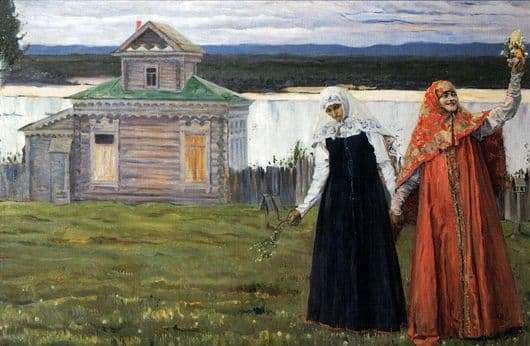 The main heroines of the canvas are two sisters holding hands, who walk along the courtyard of the monastery. The courtyard itself is located on the Volga River, around it is a wooden fence. Blue clear water flows in the river, shrouded in a light transparent haze of air. It is warm May in the yard, the grass is already juicy and light green. It is like a soft carpet spread across the skete’s courtyard. Sisters are located in the lower left corner of the picture. One of them is dressed in dark mourning clothes, with a black scarf wrapped around her head. The sister is sad, deep in thought, and as if she does not see the spring that has come around. The other one, on the contrary, is depicted in a merry festive bright sundress, on her head is a bright colored scarf, and in her hand she holds a bouquet of fresh flowers. She extends her hand and, as it were, greets someone on the other side. Her love for life, joy and joy comes spring. The artist on his canvas depicted two opposite human fates, two completely different worlds: the first world is located in the space of the monastery, it is small and closed, and the second – the earthly world – it is huge and cheerful. The artist brightly depicted his idea in the clothes of the sisters. These are two completely contrasting outfits – a mourning black and spring golden look. The picture was completely saturated with spring paints. It seems to emanate daylight, fresh air, the smell of blossoming nature and the noise of a river flowing by. In his canvas, the artist Nesterov perfectly combines the colors of spring: light green, pale blue, deep blue, sky pink and peach gold.